It's Saturday morning here. It seems as though I am still exhausted from our trip to Japan. We went to Tokyo for four days during Chuseok (Korean Thanksgiving). Four days proved to be the perfect amount of time for an introduction to Tokyo. We were able to do all of the things that we had talked about before the trip and more. Here is a short recap of the trip highlights and thoughts about Japan. There are bicycles everywhere. It was fascinating to see so many bicycles and bicycle "parking lots". It is really awesome that so many people in Japan use bicycles for transportation! Feed: Teaching in the R.O.K. I was sitting here trying to write about our summer trip to Thailand in a blog post and the task was just too overwhelming. I don't know where to start or end. I filled an entire travel journal with notes and stories about the trip. There is just too much too say about what we did and saw there. So I will just highlight a few things. The people are so warm and beautiful and accommodating and wonderful. They really want you to enjoy your time in Thailand and they are so genuine. Koh Phangan, Thailand is so laid back. It is slow paced and it really gets to you. You notice yourself slowing down over the course of a week and being content with just doing nothing except staring at the ocean and listening to the sounds of the island and not really thinking about anything. After a few days you really start to think about how you can't possibly leave and go back to your other life that you left behind. rice is a "live plant"
I was so excited to hear about this company in California that starts with i and ends in herb (one word) that ships groceries, organic products, and vitamins and supplements to Korea. The shipping was reasonable and the prices weren't bad either. So, I placed an order and anxiously awaited the arrival of the goods. A few days later, I received a call from a Korean man on our cell phone. He was asking about a package and saying something about rice and quarantine and when I tried to ask questions he told me that his English was not that good and that I should have a Korean friend call him. The next day I asked my awesome supervisor if she could do me yet another favor and call the quarantine office. She kindly offered her help (as she always does) and called the office. She then explained to me that the wild rice I ordered was in quarantine because it is a "live plant" and can contaminate Korea, etc., etc. and that there may be fines or quarantine costs to follow. We went to mudfest this past weekend. It was awesome! The week before I was not looking forward to it due to the long bus ride. But, the ride proved to be less painful than I had imagined and not as long as anticipated. We arrived in Busan Friday evening and promptly met our friends at Breeze Burn's and then proceeded to E-Mart to meet more friends and all of the other bus riders. There were a lot of foreigners there on the wall outside of the mart (maybe 25). It was so strange, because I was overwhelmed by the conversations. I could understand everything that everyone was saying, even though I didn't want to understand some of it. This was overwhelming after living in Korea for six months and being used to tuning out 99% of conversations because you can't understand them. In a crowd, I can always tune into a foreign conversation (any language other than Korean). This saying can be seen on signs everywhere around Seoul. We went to Seoul for the weekend. We wanted to revisit some places from our last trip, especially Samcheongdong. We arrived late Friday night and went back to Rainbow and Woodstock. We were slightly disappointed at the familiarity and the lack of amazement of these places that we felt last time. I guess you can never recreate the feelings that you felt the first time you saw or did something. It is sad to think about this; to think that things can never be as amazing the first time, in travel. Regardless, it is was still fun and we called it an early night. We had a three day holiday weekend for Memorial Day. Ours was one week later than in the states. We decided to go to Busan for two nights, since we usually only stay for one and always leave early and feel like we are missing out on so many fun things. We spent a lot of time on the beach. We soaked up a lot of sun, waded in the sea, played some volleyball, saw the sand festival, shot some fireworks, ate some amazing clams, climbed a sand mountain, and relaxed. All in all, an incredible weekend. The highlight of the weekend, for me, was the clam restaurant. It was an outdoor seating restaurant with blue and white striped beach tents for private dining and picnic tables along the balcony overlooking the water. We sat at a wooden picnic table with a large green umbrella. The sun was setting with the most amazingly bright colors of blue. We ordered the clams. Huge trays of clams of all sizes were brought out to our table. Hey folks, Steve here. Nikki and I were talking the other day and realized we just passed our 4 month mark here in South Korea! In some ways, it seems like time has really flown by, but in other ways it seems the opposite. It is hard to explain, but when we talk with other foreigners here they feel the same way. When we talk to friends and family on the phone or Skype, it seems like we've been gone forever and have forever until we can see them again. But, when we are out having fun exploring beaches and other sights, it feels like our time is nearly up. 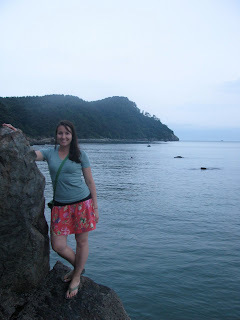 Our latest explorations took us to Dadaepo Beach, in Busan. We set out and met our friends at a subway stop and then took a bus out to the beach. Dadaepo is known for being a bit out of the way and not as built up as Busan's other beaches. It is a nice area but lacks the commercial line up of bars, hotels, and restaurants of some of the nearby beaches. Q: Do you feel like time is going fast? N: Yes and no. There is a weird time warp happening here. Sometimes I can't believe that we have been here almost four months, but other times a day can feel like a week. Our brains are always overloaded and over-stimulated so time can be a strange concept. But, it has been almost 4 months and I can't believe it! Steve and I set out today for our "quiet sitting place". There is a park near our school that has become quite beautiful with the spring bloom. Shortly after we arrived in Jinyeong we found a path off the side of the park that leads to a secluded overlook amidst burial mounds. It is a very peaceful and quiet place indeed. We have gone there several times, mostly when we are feeling upset or need to gain perspective on why we are here or, like today, to seek peace and quiet. South Korea, like other places in Asia, can be an overwhelmingly loud and bustling place. Steve and I live in a small town and still become overwhelmed with the fast pace of South Korea. Cars and scooters that zoom past you within inches of your body, crowds of people (even on mountain hiking trails), loud speakers blaring K pop on every corner. Sometimes it just gets to be too much to deal with. We seek solitude, quiet, and wide open spaces. There are none, it seems, except for our quiet place.